The CAOS (Custom Adjustable Orthotic Sandal) is for anyone looking for postural support in a stylish, comfortable sandal. 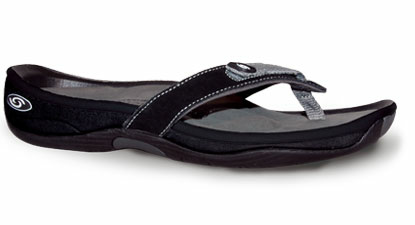 They include adjustable straps, custom 3-arch support, removable footbed and a unique design. 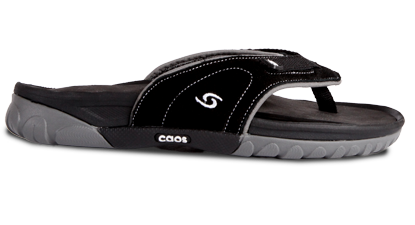 The Caos Wave is no ordinary flip-flop. It's open-toed like a flip-flop, but the similarities end there. The Caos Wave feels (and fits) more like your favorite athletic shoe, built for boating, walking, even hiking - basically the very flip-flops you'd want if ever stranded on a desert island. The Caos Riptide is no ordinary flip-flop. It's open-toed like a flip-flop, but the similarities end there. The Caos Riptide feels (and fits) more like your favorite athletic shoe, built for boating, walking, even hiking - basically the very flip-flops you'd want if ever stranded on a desert island.